We love fun and interesting wines. We love the great expensive classics. This was re-affirmed after spending two evenings tasting some of the best wines in the world with Howard Kaplan in his Ultimate Introduction to Wine Course. 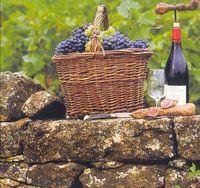 But we can't drink those rich and expensive wines every day so we are always on the hunt for fun, tasty, and inexpensive wines. Here is a gem. 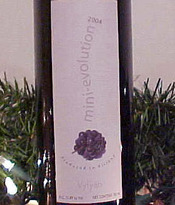 A wine from Hungary called Mini Evolution, it is a Bordeaux-Style Blend. I had this wine with a nice Italian dinner at Nauna's Bella Causa on Sunday. Ariane Duarte works wonders in the kitchen of CulinAriane. Her food is art, perfectly prepared, full of color and playfully presented. A Culinary Institute grad and former executive chef of Vine in NYC where she is pictured here. She and her husband Michael bring a refreshing new entry to the Montclair restaurant scene. Andalusia, in Southern Spain, is rich in culture, art and cuisine. Her long sunny coastline, Costa Del Sol, is dotted with enchanting fishing villages and hot resorts. It spans the Mediterranean and Atlantic, briefly separated from Morocco by the Straight of Gibraltar. The diverse population who live or travel to Andalusia are blessed with a superb climate all year round. In the heart is Seville, one of the most beautiful cities in the world. Famous for tapas and gazpacho, both born in Andalusia, and many other delicious meat and seafood dishes, Andalusia is a culinary delight and destination. Read on to experience more of this precious part of our world. Wednesday evening, homework, teachers conference, Lost, dinner at home. An excellent recipe for an easy to assemble Asian dish and wines to contrast and compliment. Gary Vaynerchuk of The Wine Library has created a great new means to learn about wine. It is called Wine Library TV. They are short QuickTime videos that you can view through your web browser. Recent Topics include: Wine Ratings, Wine Tasting Parties, South African Wines, etc. Take a look I think you will like them. 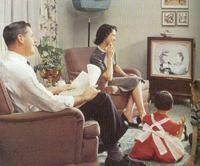 Wine Library TV is accessible from the Wine Library web site or through this link Wine Library TV. Personally there is no doubt that enjoying wine is one of life’s essential pleasures. But what would health guru Dr. Andrew Weil have to say? Tasted these wines over the last few weeks. Found some winners. 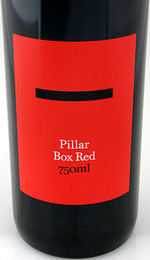 Pillar Box Red is a new favorite inexpensive wine. A delicious Cab, Shiraz, Merlot blend from Australia that can be had for less than $10.00 a bottle. Parker gave it a 90. Wonder where the name came from?